Yep, like I need more distractions and commitments in my life lol . Jennifer, my quilting bee buddy, and I thought it would be a great idea and motivator to get our bodies back in shape. I mean, I already have a round shape but I thought I'd get a more lean shape, if you know what I mean! ;o) Of course, Jennifer is only doing it to tone her muscles. So today, I brought my heart rate up to 180 beats per minute. That's about the level it goes up too when I see George Cluny! lol Of course I had to work to get it that high on the thread mill! lol I'm sure I don't need to tell you that my older body is aching at the moment! I do hope you have all had a wonderful weekend. I certainly did! We went to Massachusetts for a visit with the family. I'm sure you can guess where I spent a good part of my Saturday? Yep The Quilted Crow. I bought the book Remembrance by Jo Morton. It has some sweet looking quilts. I'm starting to develop a taste for older more reproductive style quilts. 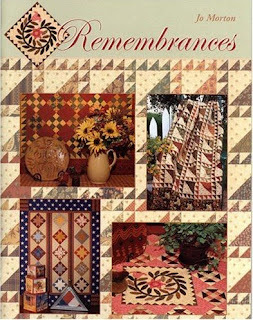 You can view some of the quilts in the book here. Of course they had a kit for one of the quilts, Peppermint Twist, that I just had to have. Okay, I think it's time for me to close this post because I'm just being silly! Gosh, I'm tired and aching! Keep fit everyone! Thanks for stopping by! I can never resist a quilt shop while traveling. They are always such friendly places in any strange town. Quilters are just family memebers to me. Good luck with the gym. Someone should invent a sewing machine that make us burn calories to make it work!!! I need to get up off my rear and get moving, too but my plate is so full right now. I'm terribly overwhelmed so I'll stay put till I catch up. Enjoy! Oh, I own that book, too - it's such a sweet book. Enjoy your new project. My daughter took me on a hike this past weekend, I think I need the gym desperately. I was winded after climbing straight up the side of a hill. Our 20 min hike turned into 2hrs...whew. Good for you doing something about it. I've got that book too and have plans to make the peppermint twist, if fact I think I first saw it on the Quilted Crow site. I am glad you bought the Peppermint Twist quilt kit. Good luck with the gym. I love Jo Morton's quilts, looks like a great book! I bet if you dangle some cute fat quarters in front of the treadmill it will raise your heart rate faster! My legs are still hurting from yesterday jogging but I don´t give up. I always have to force myself into sport but I feel very good after, so ... I keep on! Good idea to join with someone else. The book looks wonderful and the peppermint twist is my favorite too. Good luck with the treadmill and take care. Really? I can get an aerobic workout from looking at photos of George Clooney? *s* Bring on the People magazine!